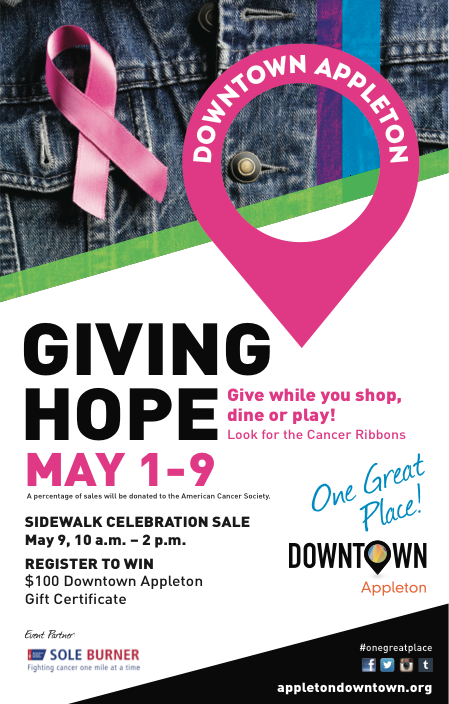 Posted on Apr 21, 2015 by Appleton Downtown Inc.
What better place than Downtown Appleton to show that you care? Support Downtown Appleton May 1-9, 2015 as the Downtown Appleton businesses support Cancer Patient Support and Research through the American Cancer Society and the Sole Burner 5K. What better place than Downtown Appleton to buy that special Mother's Day gift, go out for a great dinner or lunch or maybe make it a full night on the town? Give-while you Shop, Dine, Play! Look for businesses with cancer ribbons and signs to let you know that they support this fantastic event. These businesses have agreed to either give a percent of their net proceeds from that week or an outright donation to the American Cancer Society in honor of their Moms and all the Moms in the Fox Cities. While you are Downtown, register to win a $100 gift certificate! And this year, we've added a Sidewalk Celebration on Saturday, May 9, 2015 from 10am-2pm. Retailers and will be out on the sidewalk with some great items! If you would like to walk, sign up at http://www.soleburner.org/. Click here for a route map. Anderson Pen, 10 College Ave: Donating $10 per Sheaffer 100 Pink Pencil sold! Angels Forever-Windows of Light, 310 W. College Ave: Donating 5% of sales, free pink ribbons, plus special prize & gift certificate drawings! Appleton Beer Factory, 603 W. College Ave.: Donating $1 from sale of specialty drink. Plus selling ribbons to display! Appleton Bike Shop, 121 S. State St: Donating 10% of Ladies Road bikes & Ladies cycling apparel + Donating $1 for each Circle of Hope! Avenue Jewelers, 303 E. College Ave.: Donating funds from watch battery replacements! Bad Badger Sports Bar, 215 W. College Ave.: Hosting "Pause for the Cause" on Tuesday, May 5th & donating 60% of all sales from 4pm to close. Bellybeans, 103 E. College Ave.: Donating 1% of total sales! Blue Moon Emporium, 227 E. College Ave.: Donating 10% of sales on Saturday, May 9! Building For Kids Childrens Museum,100 W. College Ave.: Donating 10% of the proceeds from the gift shop! Crazy Sweet, 201 W. College Ave.: Donating $1 for each pink sweetheart chocolate rose! CU Saloon, 409 W. College Ave.: Donating for specialty drinks, selling pink paper bras for $1 donation, bra toss for $5 donation & more! Dance!, 225 E. College Ave. : Donating 10% of total sales! And save 20% off all pink bodywear (excludes shoes)! DePawsitory Pet Boutique, 129 E. College Ave.: Donating $1 for each Pink Ribbon treat sold! Durty Leprechaun, 343 W. College Ave.: Donating 100% of pink drink sales! Farm Market Vendors, 10 College Ave.: Collecting donations! Fox Valley Symphony, 111 W. College Ave. Suite 550: Collecting donations at the May 2 Grand Finale Concert at the Fox Cities P.A.C. at 7:30pm! Gabriel Furniture, 201 E. College Ave.: Donating $20 for each delivery charge! Globally Sound Fair Trade, 604 W. College Ave: 5/2: Silent Auction & chance to win $50 gift certificate. Decorate Globe of Hope - donation appreciated. 5/5-9: 20% off Giving Tree items plus donating 20% of Giving Tree sales! Heid Music, 308 E. College Ave.: Raffling headphones: Yamaha HPE-170 closed-back headphone, ideal for keyboarders & studio musicians. hey, daisy!, 121 E. College Ave.: Donating % of sales of Seeing Stars "Hope" products! Inspire Spa, 103 W. College Ave.: Donating 10% of total sales! Items of Interest, 10 College Ave.: Donating a % of sales! Joseph's Shoes, 10 College Ave.: Donating a % of sales! Lillians Shoppe, 115 E. College Ave.: Donating a % of sales! Massage Connection, 232 E. College Ave.: Displaying your circle of hope and collecting donations! Muncheez Pizzeria, 600 W. College Ave.: Save $1 on Cinni-Muncheez plus donating $1 for all Cinni-Muncheez sold! Murray Photo, 10 College Ave: Donating % of Promaster Items sold! Paper Discovery Center, 425 W. Water St.: Donating 100% of proceeds from hand-made paper flowers & cards plus 10% of proceeds from papermaking kits! Principal Financial, 100 W. Lawrence st. #502: Donating all proceeds from May Denim Days! The Rug Company, 127 E. College Ave.: Donating 10% of in-stock padding sales! Shear Chaos Salon & Barbering Co.,103 W. College Ave.: Donating 10% of all retail sales! Spats Food & Spirits, 733 W. College Ave.: Donating $2 for each pink martini sold! Studio 213, 213 E. College Ave: Donating a % of Sales! Vagabond Imports, 113 E. College Ave.: Donating 1% of total sales! The Vintage Garden, 119 E. College Ave.: Matching all in-store donations*, plus $1 off all "Hope" scented candles!